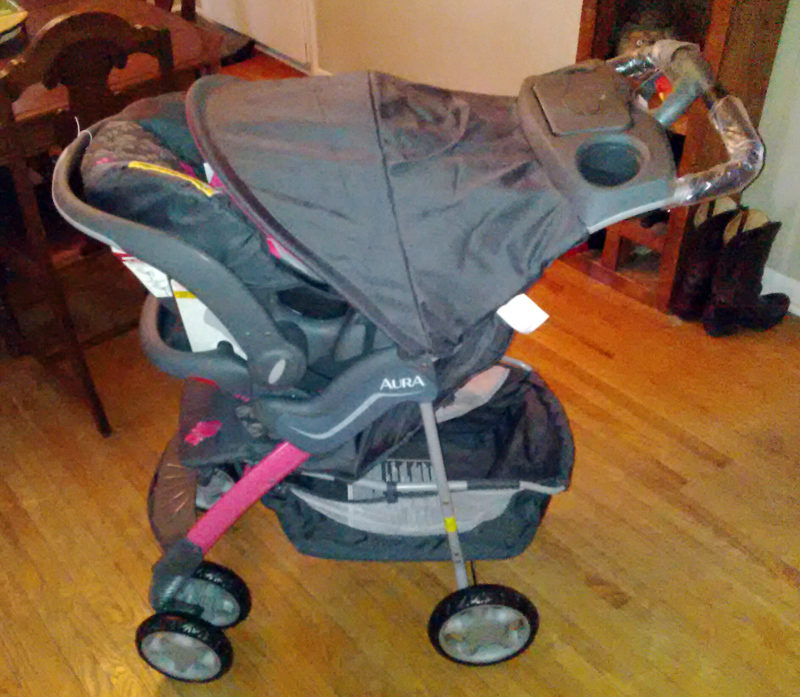 When I received the Evenflo Aura Elite Travel System for review I knew just who to give it to. My husband’s cousin Shawn and his wife Natalie are expecting their first child, a baby girl named Paisley, and they were excited to get this travel system ready for their new bundle of joy. Keep reading to hear their thoughts on it. 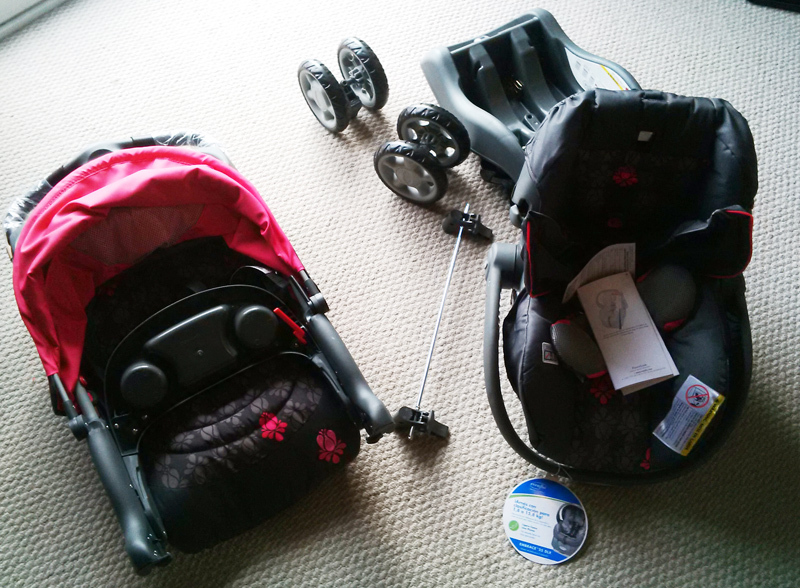 The stroller itself was very easy to assemble and was completely put together in less than 20 minutes. It is extremely light weight and easy to move in both its assembled state and packed up to go state. I was able to fold it up with the use of one hand and was able to lift it in and out of our vehicle with no difficulty. The parent tray has two cup holders with rings to grip your beverage which prevents your drinks from falling out or spilling. It also comes with a wipes dispenser which is very handy for accidental and/or unexpected messes. The basket underneath the stroller is exceptionally large and can hold a diaper bag and purse with room to spare. The child tray has the ability to fold upward when folding the stroller up so that the tray does not become damaged or scratched while the stroller is in your trunk or packed away. I believe the handle should be up when riding with baby. Please check the instructions before using. 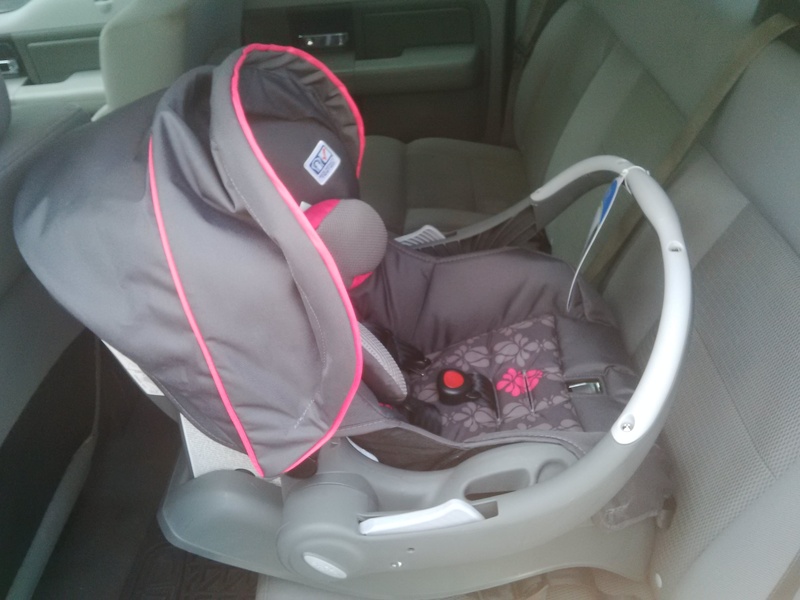 The car seat and base were also very simple to install. The car seat base was easy to level and provided two clips on the rear of the base to secure the base to the seat; luckily our vehicle comes with the tether bar built in to accompany these clips. Lifting the car seat in and out of the base was effortless and caused no struggle to clip it in place or remove it from its secure position. I was extremely impressed with the safety strap inside the stroller that attaches to the side of the car seat. 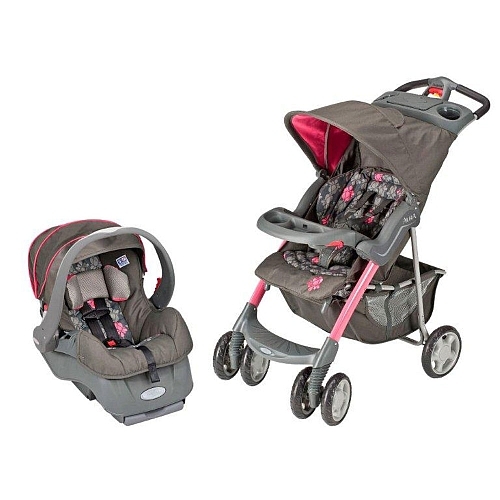 This provides extra security and stabilizes the car seat while mounted on the stroller. The canopy on the stroller as well as the car seat is a perfect fit for each other. Together they block all sun and wind and still allow you to peak at baby through the mesh window on top of the stroller canopy. The straps in the car seat and the stroller are easy to adjust as baby grows. I would highly recommend this travel system to anyone in the market for a stroller. Baby Paisley is facing heart surgery immediately following her arrival in June. You can read her whole story here: Camo for Paisley. I love Evenflo products, that top stroller is beautiful! My daughter would absolutely love that, she’s not keen on a ton of pink. It has a little bit of everything. How awesome. I wish I would have seen this system before Quinn was born. It looks nice! I love Evenflo products and just picked up some items for my daughter who is due in Feb.